DengFeng mold had designed so many kinds of Motormeter mold construction such as Honda, VW, TOYOTA etc.. We are good at this kinds of field. Offer one-stop plastic injection molding,one-stop plastic molding service and one-stop plastic injection service from China,top quality precision one stop plastic injection molding service of China. One-stop plastic injection molding service of DF-MOLDMOULD is meaning that DF-MOLDMOULD can offer you the plastic components injection molding service start from the plastic components 3D design, molds manufacturing, plastic components injection molding or plastic components surface finishing treatment and plastic components assembling. One-stop plastic components injection molding service can be started from the plastic components 3D design, also it can be started from mold making or can be started from the customers supplying the ready made molds. After the plastic injection molding service, DF-MOLD also can offer the plastic components surface treatment service with assembling and packaging services. Plastic design and mould making. This is meaning that the group is started from the mould making, in the mold making section, DF-MOLD is the very famous moulds manufacturer in the world, it has 18 years mould making history. 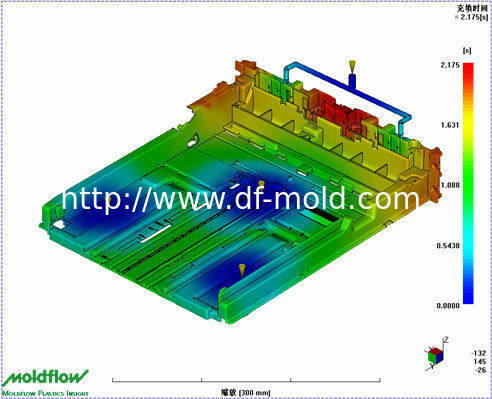 DF-MOLD Mould has strong design teams for plastic design and moulds design, has provided the plastic design service to the world plastic industries for more than 15 years. 18 years plastic moulds manufacturing experiences made DF-MOLD become one of the biggest moulds manufacturers in the world. Due to the rich experiences and rigorous on plastic mould design, reseraching on machining process and machining results inspection, the manufactured moulds are high precise, and high efficiency. It reduced the plastic injection molding cost. DF-MOLD has more than 22 sets of different size of plastic injection molding machines, has a 4000㎡ for plastic injection molding and 3000㎡ for plastic assembling and packing. 1 set DKM500 for PVC specially new. 1 set DKM380 for PVC specillay new. 2 set robot for automatic plastic moulded parts pick out and automatic packaging. Based on the top quality and high precision plastic injection molding machines, DF-MOLD also established two 500㎡ dustfree medical mouldings workshops. DF-MOLD molding service has got the TS16949 certificate, and all the process of the plastic injection molding service are followed with TS16949. Good moulds, good machines and good process kept the good quality molding services, the Italian robots system, good cooling and air conditions keep the low cost for plastic injection molding. DF-MOLD Holdings Group has two top quality PU and UV painting lines, the team with more than 8 years experience from Guangzhou, we have made many service for OEM, such like Chinese mobile phone cases sets, home appliances components, automotive inner trim plastic components...also have the partnership with one of the local plating companies. Please click this link to see some of the components which we have made. DF-MOLD has 4000 square meter for plastic components finishing quality controlling and related parts assembling with packaging.